Admiral Plumbing and Heating are fully qualified, experienced and insured Gas Safe registered engineers. Our prices are competitive and we are friendly, professional, punctual and reliable. For over 15 years, we have had an excellent reputation across Hillingdon and the local areas for providing an outstanding, honest, central heating and plumbing service. Admiral Plumbing and Heating specialise in all types of central heating systems. We can, design, supply and install a complete new central heating system or a boiler replacement. 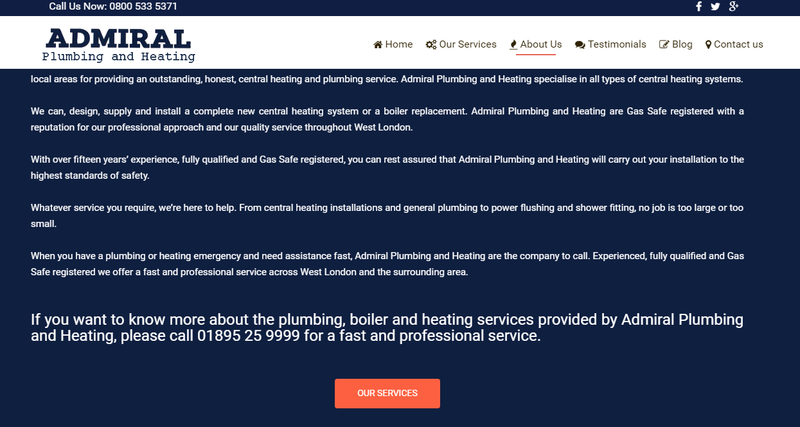 Admiral Plumbing and Heating are Gas Safe registered with a reputation for our professional approach and our quality service throughout West London. With over fifteen years’ experience, fully qualified and Gas Safe registered, you can rest assured that Admiral Plumbing and Heating will carry out your installation to the highest standards of safety. Whatever service you require, we’re here to help. From central heating installations and general plumbing to power flushing and shower fitting, no job is too large or too small. When you have a plumbing or heating emergency and need assistance fast, Admiral Plumbing and Heating are the company to call. Experienced, fully qualified and Gas Safe registered we offer a fast and professional service across West London and the surrounding area. If you want to know more about the plumbing, boiler and heating services provided by Admiral Plumbing and Heating, please call 01895 25 9999 for a fast and professional service.